Best chili recipe! This simple homemade beef Barbecue Chili recipe is flavored with barbecue sauce for an easy chili that’s sure to please. Originally published 10/2/13. Updated with new tips 8/6/18. 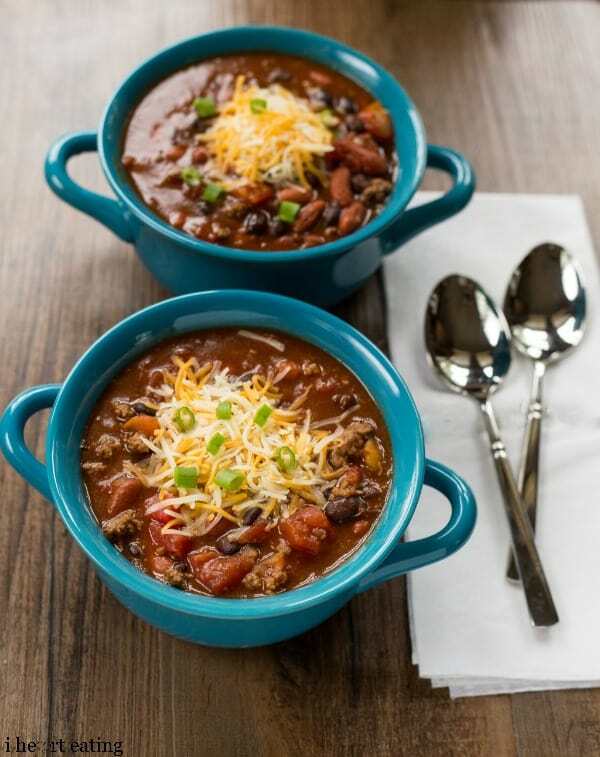 Barbecue Chili recipe is one of my favorite cold-weather dinners. I’m not much of a cold-weather person though. When it dropped to 70 degrees here the other day, I figured that it was close enough to winter. So, I made this chili and some corn bread for supper. This chili recipe couldn’t be much easier – you brown the ground beef, throw everything in a pot, and then just let it simmer. So much of the flavor of this chili depends on the barbecue sauce that you use. I usually use one with brown sugar because we like it to be a little sweet and spicy. Just choose a barbecue sauce you like, and it’ll be great! You can. I suggest waiting to add the beans until you reheat the chili to avoid any mushiness. 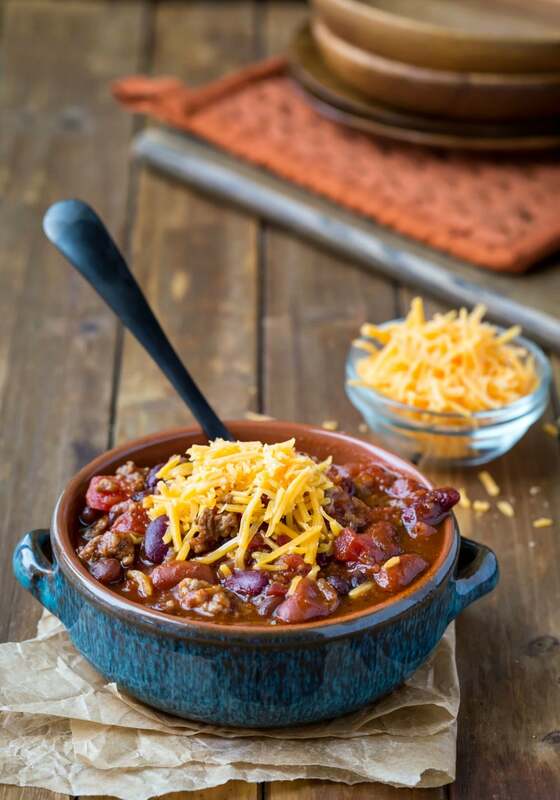 If you’ve tried this barbecue chili recipe, don’t forget to rate the recipe and leave me a comment below. I love to hear from people who’ve made my recipes! You can SUBSCRIBE to receive my latest recipe newsletters or FOLLOW ME on FACEBOOK, INSTAGRAM and PINTEREST for even more delicious food. 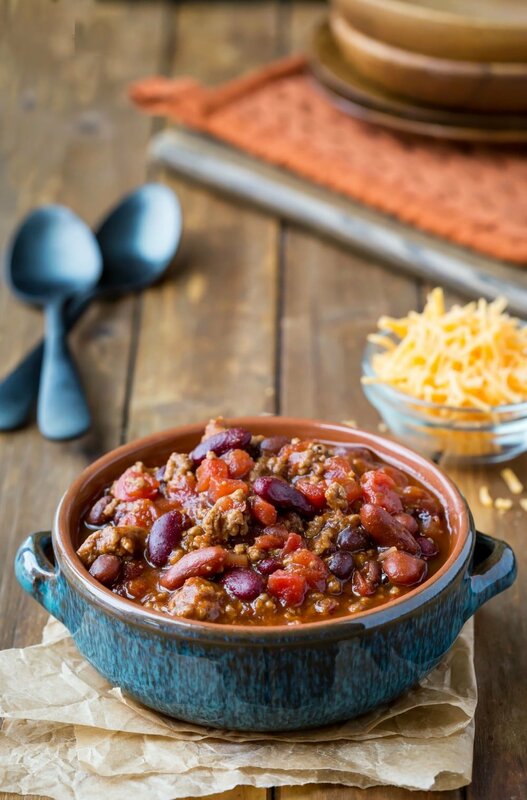 Chili flavored with barbecue sauce for a quick and tasty dinner. In a large pot or Dutch oven, brown the ground meat. Drain. Return the cooked meat to the pot. My husband about fell over he just LOVED this recipe. So excited to find your website I Heart Kate. I had a massive heart attack last summer and lived through it with lots of prayer from loved ones and my family. Since then, I am always on the lookout for heart-healthy recipes. Often modifying sugar and salt, and making my own sauces from scratch from the ingredients in my own pantry and garden. Thank you Kate.be 80 next birthday and my dr says I am one of his Miracle patients. 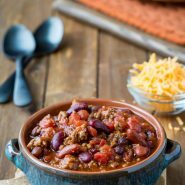 Great chili recipe! I love the flavors and how versatile it is. I’ve made it hot and spicy and mild and sweet just by using different sauces. Thanks for the recipe! It’s a keeper. Thank you! I’m glad that you like it. =) Thanks for coming back to comment! 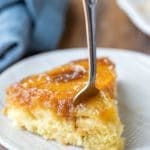 I rarely comment on a recipe but this one was so good that I had to. My family loves this and we make it all winter. I’ve been making it for years and just got around to commenting. 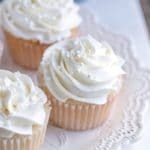 Just Love this recipe!! made it several times, I just give it my own little twist, by adding some more stuff, everyone loves it! Thank you! I’m so glad you like it! =) Thanks for coming back to comment. Delicious! Easy and tasty. Thanks for the recipe! Thanks for the great recipe. This was my first time ever making chili and loved it. Super easy and great go to meal. Great recipe! This chili looks so hearty. I’m actually entering this is a chili cook off against my neighbors. I was told no one has ever done a barbecue chili. So this will be a first. But I love barbecue chili. It makes about 8-10 servings. Sorry. I’ve never measured it out, so I can’t give you an exact amount, but that’s an approximate yield. G’day Kate! Your chilli looks great, true! I could not get my eyes off your photos today too! This sounds perfect for the next tailgate since it’s getting cooler out!! 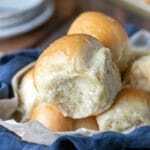 Thanks for the recipe… Pinning!! Thanks for the pin!! It is! You have to have some yummy chili once it starts to get cold =). We all love chili and I love the addition of the BBQ sauce! Pinning! Yum, I love a nice hot bowl of chili! I love the bbq twist on this recipe. Thanks for linking up at our MM party tonight! will be sharing on FB and pinning! Thanks for sharing your cool chili recipe with us at Foodie Friends Friday! YUM! I love the idea of BBQ Chili. This is something we will have to try at my house. Thanks for the recipe, Kate. And thanks for sharing at Marvelous Mondays. Pinning and sharing on social media! I love easy chili…and just chili itself! Already pinned and shared! Thank you for sharing with us gals over at the link party! I’m so happy that it’s that time of year again to drag out the chili bowls :) I’ve never added brown sugar to our chili, but I may have to give that a go! Me too!! My grandpa added it to his chili, so I always add a little to mine now, too.